Over the summer I was running a number of two week ICT in language teaching courses for teachers from around the world. The courses were part of the Bell summer campus at Homerton College Cambridge. This was the first time in a while I had been asked to teach such long courses and i thought it was a great opportunity to see if I could fundamentally change the way the teachers related to technology, not just in the classroom as a tool for teaching learners, but as a tool within their everyday working practice. As sub goals I set out to run the course with absolutely no paper. That meant no photocopied handouts and no paper based note taking from trainees. I wanted to push these teachers to the point where they could work totally in the digital medium and where paper became totally unnecessary. I also wanted to use a form of loop input (using the technology to teach the technology) so that teachers were learning about the technologies they could use with students by actually using them for themselves. I would like to add that this course took place in a computer room with 1 Internet connected computer per teacher. This was my fundamental communication tool. 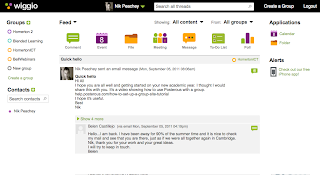 It allows me to create an instant chatroom which I can use as a backchannel so that students can communicate with each other by text and contribute to the session or just socialise while I'm talking. More importantly though, it enables me to share links to websites and digital document without having to get students to copy complex URLs into their web browser address bar. I simply paste the URL into the chat and when they get the message they click on the link and the URL opens in a new tab in their web browser. I can also use it as a kind of audience response system to get opinions from the whole class and to allow them to type in questions that I can address later. Penzu is a very simple web based private journal tool that I've been using for some time now. 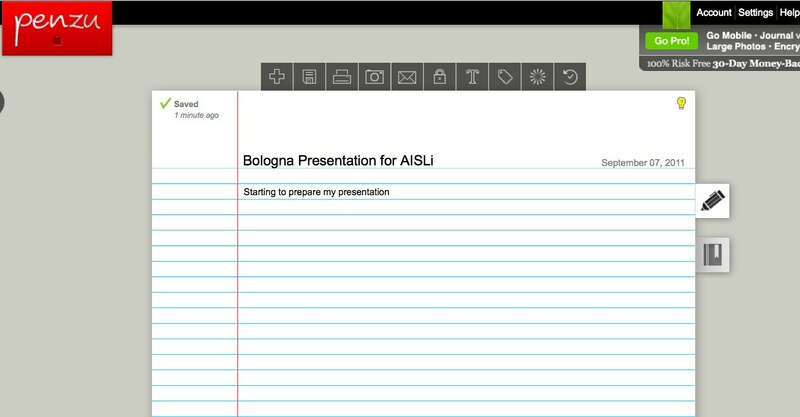 In this course I asked teachers to use it instead of taking paper based notes. Penzu is really quite minimalist and it looks just like a sheet of paper, but it stores and date stamps each journal entry and this makes it quite easy to find notes again from any computer as it is 'cloud based'. So this became one of the two standard tabs I asked the teachers to constantly keep open on their web browser. That way they could easily switch between note taking and investigating links and socialising with the class. In place of PowerPoint and Keynote I used 280Slides to prepare and deliver the presentations I included in the course. 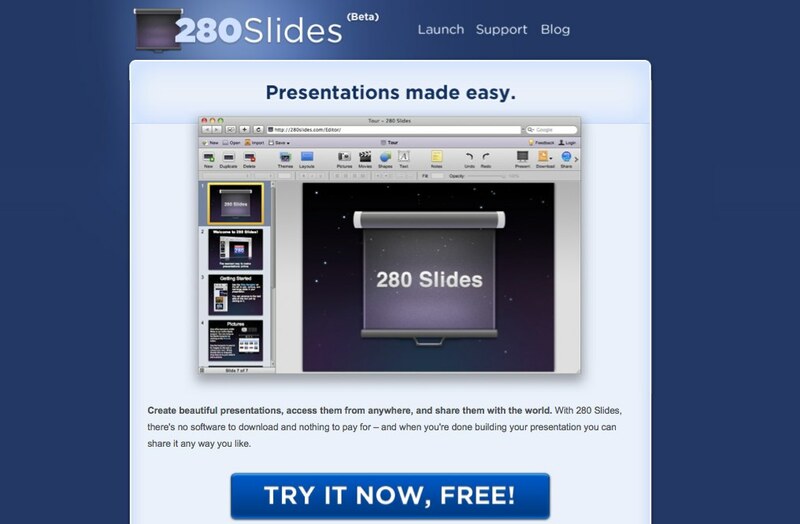 280Slides is really simple to use, stores the presentations online and creates a link and embed code so when I'm finished presenting I can instantly share the link with my group either by embedding it into a site or passing the URL through TodaysMeet. During the course I shared a lot of links to background reading materials, useful follow up websites and blogs etc. The links were passed through TodaysMeet, but to make sure these links weren't lost I got the teachers on the course to create their own Delicious accounts to tag and store all the links so they could find them later on any computer. I also taught them how to add the bookmarking plug in to their browser tool bar. This really helped as it meant they could simply click on it and tag and save everything with just a couple of clicks. 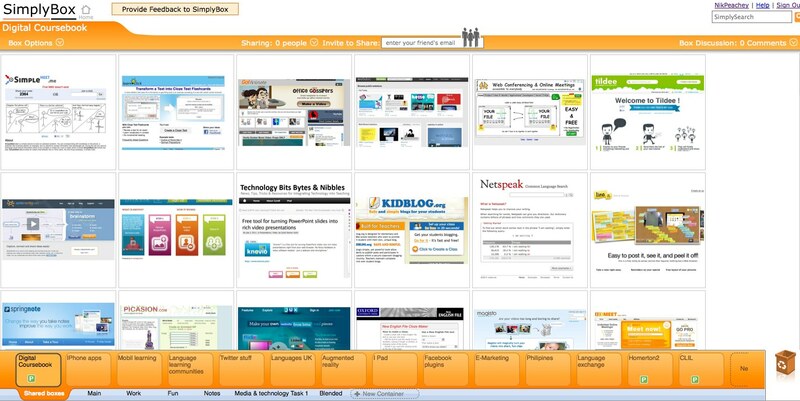 Using Delicious for bookmarking articles etc was great, but for the Web 2.0 type learning tools I was introducing I wanted something more visual as a reminder, so I used SimplyBox. This is a simple to use tool which uses boxes in place of folders and enables you to grab an image from the site as a link back to it, rather than a title. The other great advantage of this tool is that you can share boxes and work on them collaboratively and anyone accessing the box can leave notes on each of the tools. I introduced this tool about halfway through the course by putting links to all the tools we had used in one box, and using this as a revision task, I got the teachers to leave teaching suggestions and notes about how to use each tool and what its strengths were on each of the bookmarks. 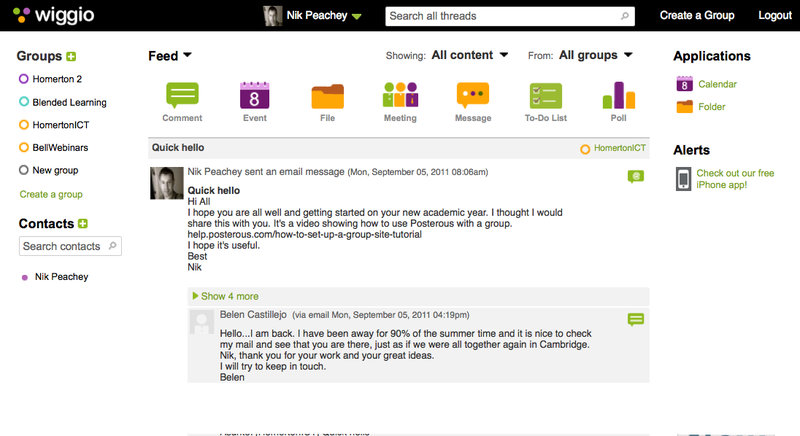 I used Posterous as my basic publishing tool for the teachers to build blended learning materials on, you can get started just by sending an email with your blog content in the body of the email and any images, videos or audio as attachments. Very few of them had done any blogging previous to the course so this was a really simple tool to get started on and it handles all kinds of media such as video, documents and embedded objects really well. So as they were building examples of online learning they were also creating their own e-portfolio. Jing was another of the core tools for the course. Initially I got teachers to use it to grab and annotate images of websites so that they could create detailed step by step notes of how to use various web tools. They then dragged the images into documents and uploaded these to their Posterous blog which formatted them into web based documents using Scribd. As the course progressed I moved the teachers on from making text and image based instructions to using Jing to make and upload video based screencasts of the websites. They could then bookmark these with delicious and later use them to show their students how the websites worked, or they could add the link to their Posterous blog which would automatically embed the video into the blog page. Towards the end of the course I introduced the Wiggio VLE to the teachers. 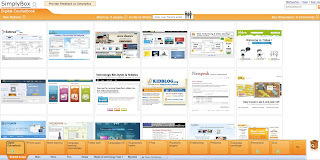 Wiggio is a very versatile and quick to create online environment which has a rich variety of communication tools. Using this platform has enabled me to form working groups from the courses so that they can stay in touch with each other and me after the course and continue to share links, videos, documents and more importantly ideas. This is a great tool for building dynamic courses and adds much more social interaction than something like Moodle. I used Tricider as my needs analysis tool at the beginning and my action research tool during the course. It's a very simple to use, but very versatile polling tool. You just create a question and add some options then share it with the people you want answers from. The great thing is that they can add extra options and add various pros and cons of each option as well as voting on the ones they like. This makes the whole process of polling much more open, social and interactive. Last but not least is the Firefox browser. I use this as a replacement for Internet Explorer. I find Firefox to be fast reliable and consistent and especially when working with Web 2.0 type tools it gives me very few problems. I can say none of this about IE which I often end up cursing whenever I have to use it in a training environment. their students will probably be negotiating in their future. Most of all though they had a chance to actually use the tools in much the same way that their students will and to make and overcome the kinds of mistakes they will have to deal with students in class. I hope you have found something interesting here and this article makes you think a little more about how you deliver teacher training in general as the use of these tools isn't just restricted to tech training. They could be integrated into the delivery of any language or teacher training course and to some extent I feel that until tech tools are integrated into mainstream teacher training we aren't going to get the quality and quantity of digitally literate teachers that we need to really provide a 21st century learning environment for our students. Nice collection of tools, Nik. Thanks for sharing. Thanks so much, Nik for sharing the 10 tech-tools with all of us, Webheads. I'm definitely going to use some of them for my classes of this Fall 2011. Really appreciate your great work and assistance to EFL/ESL/ESP teachers everywhere in the world. Hi Nik, and thanks for sharing the tools you used in your training course, I'm sure the teachers got a lot out of it. Funnily enough, while you were giving your two week courses in Cambridge, I was doing exactly the same thing in Barcelona. We had the intensive two-week f2f component of the blended Cert ICT, with five hours of input a day (phew!). I'm also a big fan of the paperless classroom, and have been using Edmodo for this for a while. I haven't tried TodaysMeet though – do you think there are any advantages with one over the other? Hi Nik - thanks for this article and for sharing all these really interesting ideas. I will definitely have a closer look at many of the tools you've described. I think one of the most difficult things is finding the tools in the first place as there's just so much out there, but luckily you always do a lot of that hard work for us :-) Thanks again. Amy. Thank you very much for sharing these training tools. I like your concise and very user-friendly approach in explaining how you use them. I'll definitely be highlighting this post to the next group of teachers I teach! 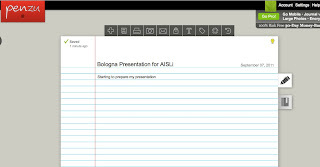 Also, the idea of teaching totally paperless appeals to me, and I would love to try it out one day. A question which intrigues me, is - did you meet any initial resistance from teachers about not receiving any photocopies at all? Dear Nik: as always you're sharing practical ideas with all of us. Many of these tools have been used (because of your previous recommendations), you inspire us all the time, but having them together, is a plus !! Hi Nick, I have been following your posts for a long time from India. This course seems amazing and I shall certainly explore all the exciting stuff you have mentioned. Thanks a lot. I found this article very useful and I hope I will be able to use them in future.Thank you for all the hard work that you do and then share your experience with us,which makes things easier for us. Thank you for sharing the course with us, Nik. I was one of the teachers following the course described here and living proof that teaching after having followed this course really does change! All these programs are easy to use and fun to do after you figured how it works! I am still having loads of benefits after doing this Bell Course! Big thanks Nik! Very useful list , Thanks Nik for sharing it ! Thanks Nik for sharing - they are all amazing tools! I enjoyed reading how you used these tools in concert. Just curious: any reason you did not use Google's tools, i.e., Groups, Docs, Sites, etc. Allah bless you Nick. As usual; you educate us by sharing your ideas . 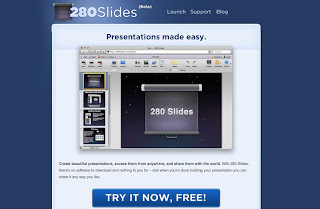 I have come across a very good presentation tool ,may be you know it ( Perzi.com) ,it is a zooming presentation tool . I am trying to present it to every educator . Bless you. Thank you Nick for your sharing. Thanks Nik for being one of your digital trainees at Homerton. I can't believe how many options are out there as far as technology goes. It seems like once I learn about one, another one creeps up. Thanks for the comparison of them all. Simply amazing! Thank you for sharing such helpful tools!